Veterinary diagnostic imaging includes radiographs (x-rays), ultrasound, MRIs and CT scans, all of which are used as diagnostic tools to collect information on your dog's health. The vast majority of imaging is non-invasive and completely painless. However, some imaging may require sedation or even anesthesia because the dog must be kept still to allow for adequate images to be produced. Veterinarians use these images to collect information on your dog to help them to make a medical and sometimes surgical plan. When Is Veterinary Diagnostic Imaging Necessary? After your veterinarian has examined your dog, he or she may want to begin to collect more information that will lead to a diagnosis and then, a treatment plan. X-rays are usually a first line of imaging. The x-ray may lead to a diagnosis which allows them to move forward with a plan. However, sometimes the next step may be ultrasound to get a more thorough or specific look at a particular area of the body. For instance, if your dog is vomiting and feeling ill, your veterinarian may take an xray to look for possible causes such as obstruction of intestines or an obvious foreign body. The x-ray may show some signs of an intestinal obstruction, however, before proceeding to surgery, it would be prudent in some cases to follow with an abdominal ultrasound. The ultrasound will give more detail of the questionable area and therefore allow more confidence of the treatment plan to move forward with surgery. Occasionally, x-rays and ultrasound allow for a definitive diagnosis but other times they will simply add more information to help put the puzzle together for the best treatment plan for your dog. Dog x-rays have been in use throughout the medical community for many decades. Dog x-rays are by far the most regularly used form of diagnostic imaging in the veterinary industry because they are cost effective (comparatively speaking), and they can accurately diagnose the state of skeletal structure and composition, large body cavities, and the presence of many foreign objects. Dog x-rays are totally painless, but some dogs can benefit from sedation to reduce anxiety and stress. 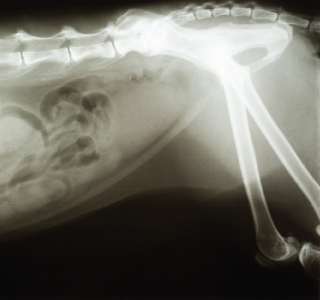 Dog x-rays have traditionally been captured on actual film, and still can be when necessary. However, our x-ray images are now digital which allows us to capture the images on a secure server that our veterinarians can access at any time, and can also share with specialists, if necessary. A dog ultrasound is the second most common type of diagnostic imaging tool veterinarians use to diagnose a dog's medical condition. Ultrasounds use soundwaves to examine and photograph internal tissues in real time. An ultrasound allows a veterinarian to see into a dog's body in real time, allowing for easy viewing of organs from different angles that are not easily achieved through x-rays. The functioning of various organs and blood flow can be observed to determine if they are malfunctioning. In modern scanning systems like the ones Lowell Animal Hospital has on-site and uses on our canine patients, the sound beam sweeps through the body many times per second. This produces a dynamic, real-time image that changes as the dog ultrasound device moves across a dog's body. We can use the results of an ultrasound to determine what is ailing your dog, and to devise the most effective treatment protocol. Magnetic resonance imaging, or MRI, is the newest form of diagnostic imaging being used for both human and veterinary medicine. Dog MRI equipment generates a very powerful magnetic field, resulting in detailed anatomic images of whatever part of a dog's body is being scanned. No x-rays are involved, and a dog MRI is considered extremely safe. A dog MRI is not used as regularly as an x-ray or ultrasound because the equipment is very expensive, very large, and requires specially trained technicians to operate. However, Lowell Animal Hospital offers comprehensive dog MRI services because we believe that facilitating complete canine care means having all the tools and training necessary to do so. CT scans for dogs, also known as 'cat scans', are computer enhanced dog x-ray procedures most often used to evaluate complex parts of the body, such as the head, chest, some joints and various internal organs. CT scans show different levels of tissue density, and produce more detailed images than x-rays. Unlike MRI's, CT scans for dogs do not use magnetic field waves so they cannot compare changes in fluid levels due to inflammation or bleeding. Therefore, CT scans for dogs are used in situations where an MRI is considered unnecessary but a traditional x-ray is inconclusive or insufficient. Just like MRI equipment, CT scan equipment is very expensive, large and requires trained technicians to operate. However, and in our mission to make sure all diagnostic imaging tools are available for your beloved canine companion to benefit from, we provide CT scans for dogs at our veterinary hospital. The goal of canine radiographs is to ascertain a diagnosis, or obtain a final answer without having to perform further, more invasive tests or procedures. For example, an x-ray might show some soft tissue swelling in the knee but the addition of an MRI would reveal the specific tendon or ligament tear that is causing a dog to limp and allow for a more specific treatment plan, diagnosis and prognosis. Veterinary diagnostic imaging offers an array of incredibly useful tools within a veterinarian's toolkit. Sometimes a diagnostic imaging session can lead to the need for further diagnostics. This is why it is important to understand that diagnostic imaging may lead to a progressive fact-finding mission that must occur in order to diagnose your dog's ailment. If you are concerned that your dog might be injured or experiencing internal problems, or to discuss how canine radiographs can benefit him or her, please speak with one of our veterinarians today.